Mexico city, 28 Jul.- Created by mexicans and with a philosophy based on return to the origins of beauty, Orbell is the new mexican company of natural products, that will revolutionize the personal care of women and men in our country. With a select line of personal care products, Orbell bet by returning to the origins of beauty, using 100% natural ingredients combining tradition, health, innovation and the best quality in their products. At present, the demand and consumption of natural products has increased, mainly due to the problems caused in the skin the chemicals with which are made the products of the cosmetic industry. And although they tend to have larger advertising campaigns and great prestige, it is true that in most cases, these products do not leave any benefit to consumers and, on the contrary, there could be significant damage to the skin. These cosmetics are just as practical and useful to the industry but much more healthy. For example, is not the same untarte masks home made from egg or yogurt, a cream composed of ingredients that most of the times, we do not know its origin. It is important to know that there is an alternative to the cosmetic industrial, equally comfortable, much more effective and healthy long-term. Orbell is to replace the creams industrial mixtures of vegetable oils and essential 100% natural cosmetic formulae of traditional and effective. Cosmetics and products created with natural ingredients and craftsmanship, are the best alternative to counteract the damage caused to the environment by large industries. In addition, thanks to these products generate trades fair and ecological guidelines follow production and marketing of concrete, with which they are committed, as the products Or bell that are not tested on animals and are concerned with the care of the environment. In the market there are chemical products with an affordable cost that may offer benefits and immediate results. However, the long-term consequences could be very harmful to your skin. If you compare the creams of prestige that we find in the cosmetic industry, the alternative of the natural cosmetic is actually much more economical, taking into account the quantities and expiration dates. Orbell recommended to be aware of to change our routine and helping our bodies with natural alternatives, which with time will provide benefits in the life of the consumer. 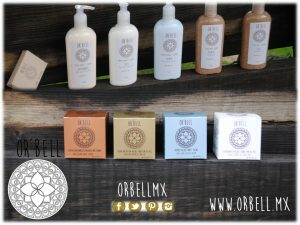 The full product line of Orbell, can be acquired through its official website that is www.orbell.mx, or through their social networks in facebook.com/ORBELLMX and Twitter.com/orbellmx.